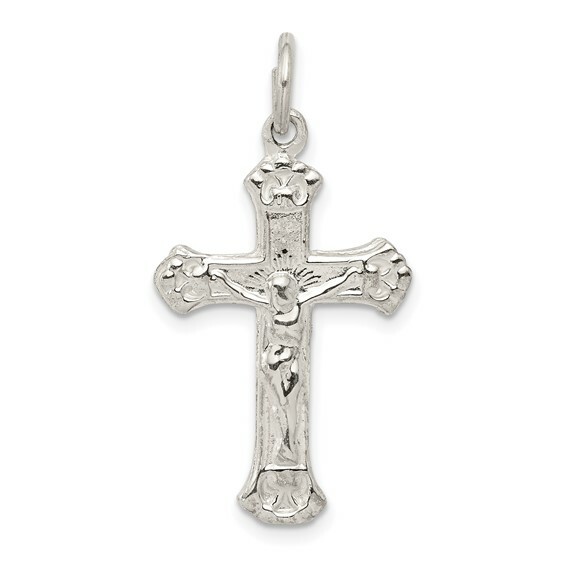 This budded crucifix is made of polished sterling silver. Weight: 1.37 grams. Measures 1 inch tall by 5/8 inch wide without bail. Made in the USA. Crosses with a representation of the body of Christ, or corpus, are crucifixes and recall the death and resurrection of Christ. My youngest son wanted a cross to match the one I've worn for years but I couldn't find one. I stumbled on to their site and there it was.when he opened up his Christmas gift to find it he was very happy.